The first monopile has been driven: Construction work on the wind farm Nordergründe in the North Sea began yesterday. Underwater cable-laying work is now also underway. wpd is responsible for the construction and operation of the 111-MW project. A total of eighteen Senvion 6.2M126 turbines will be installed in the Weser estuary. The wind farm is being built in water depths up to 10 m inside of the twelve-nautical-mile zone of the German North Sea and is located 15 km north-east of the island Wangerooge. The grid operator TenneT will connect it using an individual connection. "We are pleased that work has now successfully begun at the construction site. The team did an excellent job, and we are now able to begin installing the foundation structures after extensive preparations. We plan to begin normal operation at the end of 2016", said Achim Berge Olsen, Managing Director of wpd offshore GmbH. 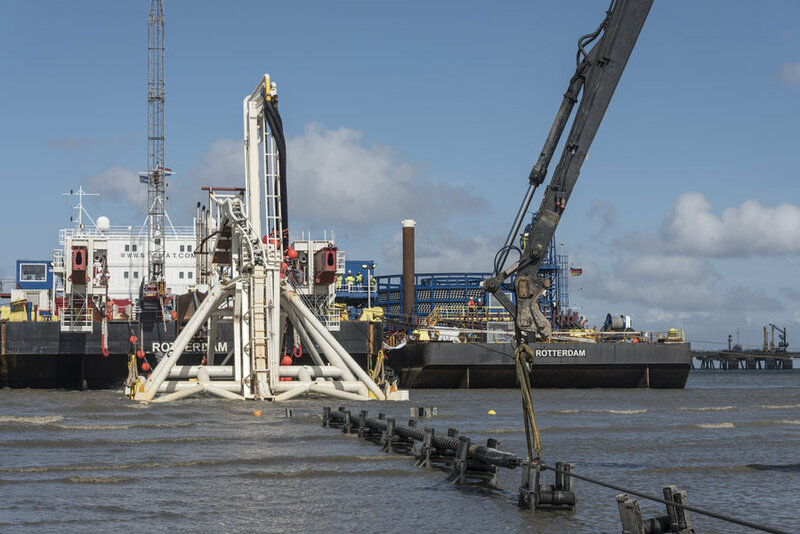 The transmission grid operator began laying the 28-km submarine cable after it had been pulled through the empty conduit under the dike, TenneT stated. According to the company, the cable route in the North Sea was first investigated and cleared of magnetic anomalies such as old ammunition from the Second World War. Preparations for laying the submarine cable followed in mid-March. The actual cable-laying work is now underway. TenneT states that it is on schedule with the installation of the offshore grid connection. The last piece of the submarine cable will be stored on the seabed near the wind farm approximately 15 km east of Wangerooge until Nordergründe's offshore transformer substation has been built. It will then be connected to the substation. According to wpd, Nordergründe is a unique project. It is the first German offshore project whose technical deliverables will be provided exclusively by German manufacturers who have production facilities in the north-west region of Germany. In addition to Senvion (turbines), the following companies are involved in the project: Ambau (foundations), BAT (substation), NSW (internal cabling for the wind farm), and Bilfinger (installation). Funding for the project was finalised in June 2015 with the participation of the European Investment Bank and KfW IPEX. In addition to wpd, the Gothaer Insurance Group has been acting as an equity provider since last year, according to the project developer. According to TenneT, the four-kilometer land cable was laid in 2012. It runs to the substation near Inhausen, which was expanded for this purpose in 2013. Nordergründe is the third project inside of Lower Saxony's twelve-nautical-mile zone where TenneT has implemented a grid connection for an offshore wind farm using AC technology, the company stated. Since the Nordergründe wind farm is just 30 km away from the coast, this is technically and financially the most efficient solution. The connection is being implemented using a 32-km, 155-kV cable with a capacity of 111 MW.